Many members of the conservative US Republican “Grand Old Party” had been looking to the anti-establishment Tea Party for a revival in fortunes. However there are concerns that masturbation expert Christine O’Donnell may just be too much of a political maverick following revelations that she has a history of dabbling with the occult and other anti-Christian activities. Ms O’Donnell has responded to the criticism explaining that many people probably had friends and interests in their youth that do not necessarily represent their views as they have got older. The Tea Party was founded to break down traditional politics. Its members have publicly condemned as a Nazi plan the attempts of President Obama to try and prevent millions of poor Americans from dying. However the latest revelations about the occult have, in the eyes of many in US politics, aligned her too much with mainstream thinking. 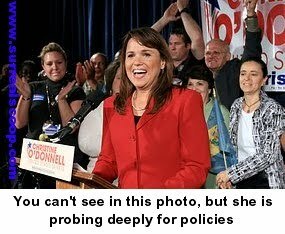 Ms O’Donnell shot to US public attention with a surprise win of the Delaware Senate nomination and then gained notoriety following the publishing of her views on masturbation.